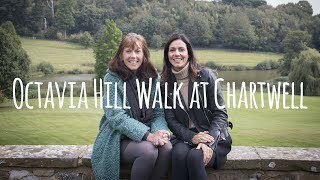 Celebrating the life of National Trust founder Octavia Hill, this walk takes in the picturesque village of Ide Hill, Emmetts Garden, and wonderful Weald of Kent views. Octavia Hill (1838–1912) was a social reformer, philanthropist, artist and writer. The National Trust grew out of her campaign to preserve the countryside and protect ancient and beautiful buildings. A remarkable women whose vision is still a major influence today. that Octavia Hill sunk for local residents, from which you can enjoy some of the best views across the Weald to Ashdown Forest in the far distance. Tracking woods and crossing fields the trail then brings you to Octavia Hill’s commemorative seat close by Ide Hill’s pretty church and village green. The footpath then passes through the north and south gardens of Emmetts where you’ll find a café. If you would like to enter the gardens you’ll need to buy a ticket. There’s something to see here all year: bluebell drifts in the spring, romantic roses – some planted in Octavia Hill’s memory – in the summer, vibrant foliage in the autumn. And more of those stunning countryside views. From Emmetts you can return to Toys Hill via a shorter footpath. TOG went along to film Julia Bradbury talking to Maggie Morgan about Octavia Hill’s enduring legacy.